Its ok to do if your a lib, and the person your are insulting is a conservative. He's liking this new version of himself. I thought it was funny how SNL made fun of his "secret." Exactly my point. I heard he was gay, like 15 years ago. Nobody gives a sh1t. Why do you keep trying to brand me as a liberal? I dont consider being gay as an insult though. I just find that he is still in the closet and afraid to come out as silly. And if somebody is holding it over his head so he says certain things and behaves a certain way, then that is pretty bad. Somebody should tell Graham that nobody cares anymore. I dont consider being gay as an insult though. SNL does think it is an insult. But they used it against a pub, so all is forgiven. I know. GA seems to be struggling with it, so I tried to simplify it for him. I hope Lindsey Graham can communicate with his good friend Jeff Flake and make sure he's a yes vote. I don't trust flake but I've learned to trust Graham a little bit in the past few weeks. Be careful Scott. 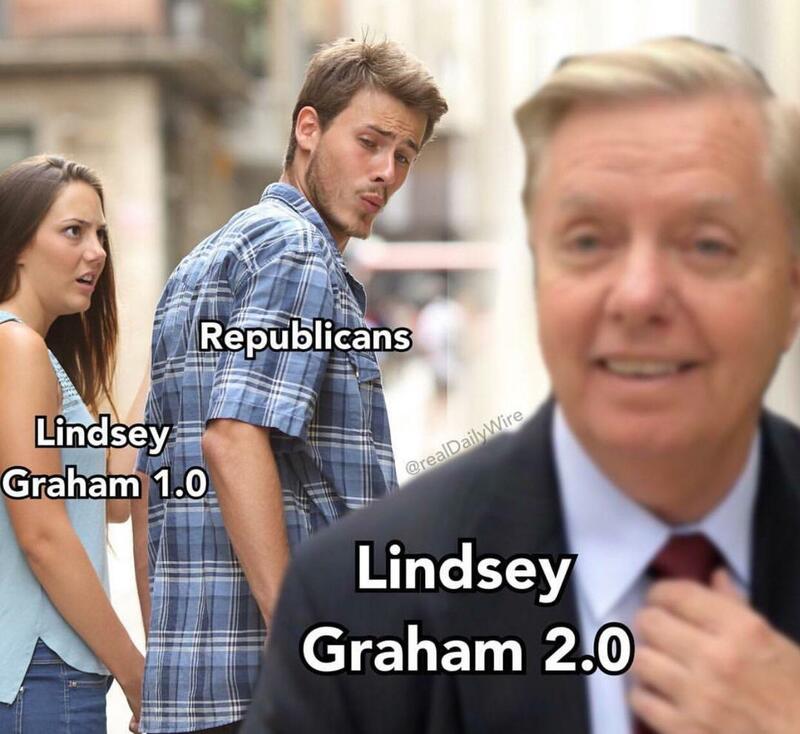 Lindsey is as deep a swamp creature as they come. I hope you are right though. I know that and he was a never Trumper for a long time and a good friend of the late John McCain. But Graham has come up big in the last few weeks undeniably. Fingers crossed. Some of the Senate races don't look good for the Democrats and I'm hoping Democrat Senators running for reelection Heidi heitkamp Claire mccaskill and Joe manchin do not vote for judge Kavanaugh and he still gets appointed with 50 or 51 Republican votes. If they vote no that should hurt their chances to be reelected on November 6th. It's easier than saying commie marxist. I know that and he was a never Trumper for a long time and a good friend of the late John McCain. But Graham has come up big in the last few weeks undeniably. He knows the deal. The moderocrats Republican establishment pushed Kavanaugh. He was one of them. If Kavanaugh didn't get the seat, Drumpf was going to nominate a conservative next. Swamp creature is a good thing. Correct. This may result in other Bush Republicans now supporting Trump.